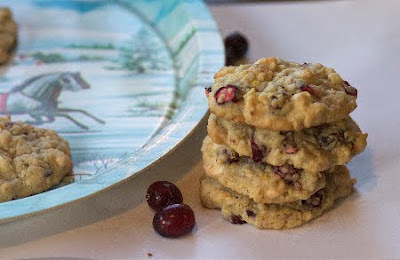 cardigans and kids: cranberry, white chip & oatmeal cookies. cranberry, white chip & oatmeal cookies. In a mixing bowl, cream butter and sugar. Add eggs, one at a time, beating well after each addition. Beat in vanilla. Combine flour, baking powder, salt and baking soda; add to the creamed mixture. Stir in oats, raisins, cranberries and orange peel. Stir in vanilla chips. Drop by rounded teaspoonfuls 2 in. apart onto parchment paper covered baking sheets (or you can grease them). Bake at 375 degrees for 10-12 minutes or until edges are lightly browned. Cool on wire racks. Yield: 4-5 dozen. *This is one of my favorite cookies I make during the winter. As soon as I start seeing cranberries at the store - I begin to anticipate the aroma these make while baking. They are so worth taking the time to grate an orange and chop up a bunch of cranberries! These look appetizing and sound absolutely yummy! Thank you for sharing your recipe... one I hope to try soon! Yep, this recipe goes into the "try it soon" stack! Thanks & Happy Trails!